Horsetail Herb: Another Miracle Medicine Mistaken for a "Weed"
Like dandelion, horsetail herb is a miracle medicine often mistaken for a weed. Horsetail is one of the best sources of silica, which helps the body produce collagen, a building block of your hair, skin and nails. One study found it increased hair growth, volume, and thickness — literally doubling the number of hairs — in women with thinning hair. Another study found horestail strengthened nails, significantly reducing splitting, fragility and longitudinal grooves. Because of its collagen-boosting properties, horsetail is also thought to have anti-aging and skin toning properties. Horsetail has been used since time immemorial to stop bleeding, to treat ulcers, wounds, ruptures and inflammations of the skin. One study found horsetail ointment helped women heal from episiotomy wounds faster, while significantly reducing post-op pain. The silica sealed the wound, while the flavonoids helped prevent infection. The ability of horsetail to literally pull heavy metals from our bodies and the soil has been well-documented and studied. One study found drinking a liter of high-silica removed aluminum without removing essential metals like iron and copper. “We have provided preliminary evidence that over 12 weeks of silicon-rich mineral water therapy the body burden of aluminum fell in individuals with Alzheimer’s disease and, concomitantly, cognitive performance showed clinically relevant improvements in at least 3 out of 15 individuals,” the study’s author’s wrote. A 2013 study found that horsetail is one of several herbs that contain kynurenic acid, which possesses anti-inflammatory, antioxidative and pain-relieving properties, especially for rheumatoid arthritis. It can be used to alleviate the redness from eczema, acne and other skin conditions. The flavonoid isoquercetin in horsetail acts as a mild and safe sedative. It is also rich in calcium and magnesium, minerals known for soothing and calming the nerves. Horsetail tea is used for reduces irritability, hyperactivity and insomnia. Research has shown that silica stimulates bone-building cells. Collagen provides the framework of your bones, while calcium and other minerals fill in and strengthen that framework. In an Italian study found horsetail significant improved bone density. Another study found that a blend of horsetail and mushroom chaga was effective at reducing lymphoma and leukemia tumors in mice, increasing survival rates by 33 percent. 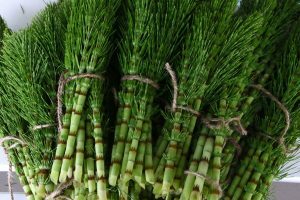 To make a strong infusion, boil a half cup of dried horsetail in 2 cups of hot water for 10 minutes. Let sit for 1-7 hours. – Herbal Hair Rinse to strengthen hair and stimulate growth. – Skin Tonic for glowing skin soak a paper face mask in the tea and wear it on your face for up to 30 minutes. – Sore Throat. Mix the infusion with some sea salt. Gargle a couple times a day. – Gingivitis. Gargle/swish 3-4 times a day. You can also sit in a bath of horsetail herb to soften your skin, and also get rid of urinary tract infections. Horsetail herb can also be taken internally as a tea or in capsules . Here’s a blog post about identifying horsetail in the wild and preparing it for medicinal uses.